Twice exceptional children need our help. They need our help and support and love. They need people to know who they are and what makes them special. They need to know how to use their strengths to help compensate for their difficulties. They need to have the opportunity to pursue their interests and learn and grow in their areas of giftedness just as much as any. other. gifted. child. The times I've had the privilege of teaching children with dual exceptionalities have been both the most challenging and most rewarding experiences I've had as a teacher. 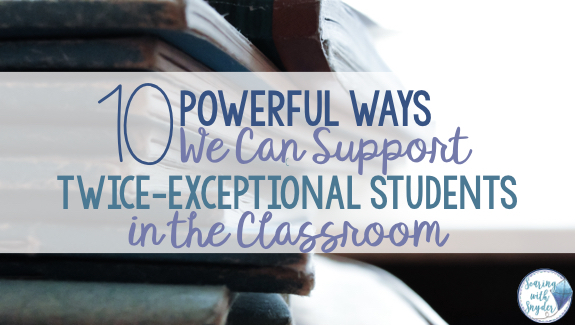 Today I'm offering some tips that helped me meet the needs of these special learners. As a reminder, twice exceptional children are those who are both gifted and have a significant developmental weakness in comparison to peers of the same age. You can read more about characteristics and signs to watch for in my post here. As of 2006, it was estimated that nearly 70,000 2e children had been identified. You can imagine that as districts have grown stronger in identifying these children, that number has only increased. Be thorough in our identification--taking a look at the WHOLE child, an evaluation should include many areas including academic skills, cognitive abilities and processes (memory and reasoning skills), areas of concern, social and emotional strengths and weaknesses, and other contributing factors. We have to get a thorough picture of what the problem is before we can solve it. This means that we need to enlist the help of both the parents and a team of professionals who can help collect all of this information. Create a supportive classroom culture. It's important that we establish an environment in which children are supported and appreciated by each other in (and out of ) the classroom for their differences. The more we talk about the diverse needs of everyone in the classroom, and the more regularly we provide differentiated instruction, the more it will become normal. There are lots of ways to do this, and I suggest using explicit direct instruction and LOTSSSSS of modeling in the beginning of the year, and again throughout the school year as needed. Make sure strengths are served FIRST. This can lead to a student's higher self-concept and reduction in tension caused by exceptionalities. It also helps other students see and respect the child for his or her strengths, improves social interactions, and of course encourages growth in learning in the child's area of giftedness. 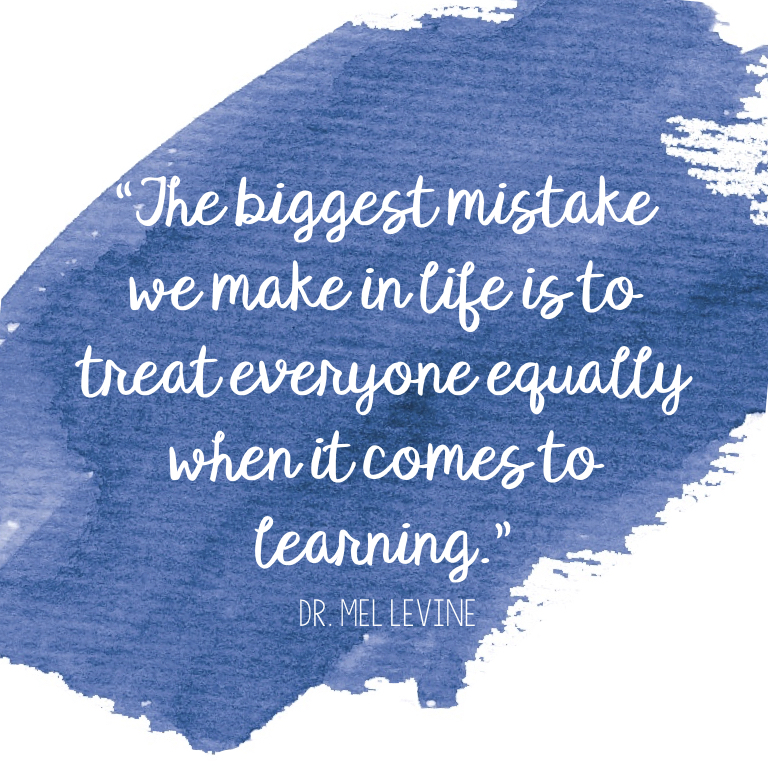 The rule to follow when teaching students who are twice exceptional is simple. When teaching in their areas of strength, offer them the same compacting and differentiation opportunities available to other gifted students. When teaching in their areas of challenge, teach them whatever strategies they need to increase their learning success. Never take time away from their strength areas to get more time to work on their deficiencies. Never remediate their weaknesses until you teach to their strengths! 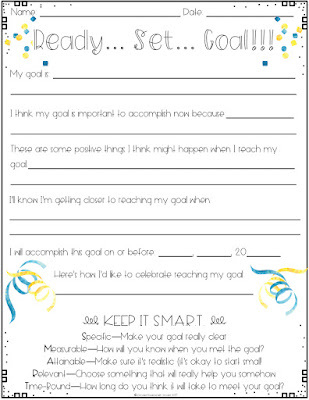 Get students help for their challenge areas. Often this involves the creation of IEP or 504 plan with your school's intervention team. Again, just be sure that time for intervention is not taking away from the time when the child's strengths are being nurtured. Will spell-checking software allow the child to write more fluently? Let them use it. Will a calculator help speed up the process so that the child can work on the more complex math skills you're learning about? Let them use it. 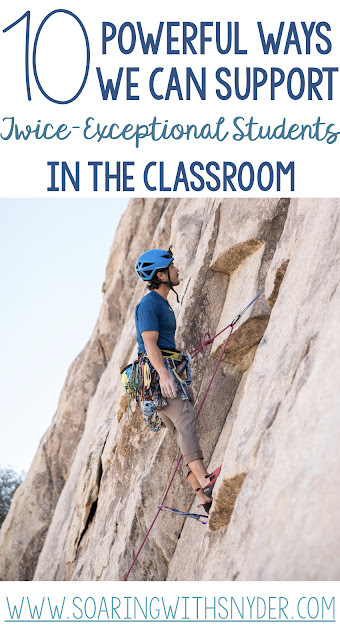 Would allowing your dyslexic student to listen to an audio recording of your class novel help remove a barrier so that they could focus on the comprehension skills you're teaching? LET. THEM. USE. IT. I'm not suggesting that these students shouldn't work on strengthening those spelling, calculating, or reading skills, but I am suggesting that we think critically about what our true objectives are for the lessons. We shouldn't penalize a child for needing some extra time if your learning objective isn't to increase completion speed. You can find a really great list of possible accommodations here. Provide lots of help with organization. Use systems in your classroom that encourage routine and help students build their skills in managing time and materials. BUT, remember that this, too, is a learning process. Twice-exceptional students won't always remember to do things just the way you've shown them. Provide a gentle reminder and move on. If the routine isn't working for the student, maybe it's time make adjustments or offer extra support until it gets better. Have patience. 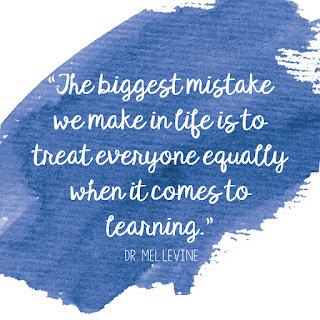 This is true for all the areas of teaching children, no matter what their needs, but it is especially true for the child with dual exceptionalities. Part of what will help their success in your classroom is their connection with you. They need to know that you understand their struggles and that it's okay to make mistakes in your presence. Be flexible. It's not an easy journey, and no two students are going to be the same. Sometimes what works one day may not work the next. Adjustments need to be made, and life needs to go on. Having you as a model for flexibility will also help your students the benefits of going with the flow. Are there other tips or resources you suggest or have found helpful in your journey with 2e kids? I'd love to hear them. Leave me a comment below! Mickenberg, Karen. 2017. Understand the Gifted Underachiever and Twice-Exceptional Student. CTY Webinar, Johns Hopkins University.